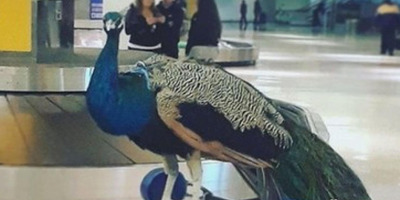 CNBCAn emotional support peacock that was denied entry on a United flight shows the growing problem of pets on planes. United Airlines has confirmed a passenger’s 10-month-old puppy died after suffocating in an overhead bin on a flight. The dog dying reveals a problem for airlines – how to serve passengers flying with pets while keeping planes clean and safe. United Airlines is in hot water after confirming that a passenger’s pet dog died on one of its flights. The 10-month-old puppy died Monday evening during a flight from Houston to New York’s LaGuardia Airport. Maggie Gremminger, who says she was a passenger on the flight, said the dog was travelling with a woman and her two children and was being kept in a TSA-approved dog carrier. She said in a photo on Facebook that a flight attendant forced the dog’s owner to put the carrier and its occupant in the overhead compartment. The tragedy reveals a larger issue facing United and other airlines – what to do with pets on flights. From emotional support animals to regular pets, airlines have struggled to serve customers while also keeping planes clean and safe. Earlier this month, Delta Airlines’ announced it would impose tighter regulations for passengers travelling with qualifying service or emotional-support animals. The airline said it had seen an 84% increase since 2016 in incidents involving improperly trained animals, including urination, defecation, and attacks on passengers and crew members. The regulations will require passengers to show Delta documentation of an animal’s health 48 hours before a flight. Passengers travelling with an emotional-support animal will also need to present a signed letter from a doctor or mental-health professional, as well as a signed document saying the animal can behave properly during a flight. According to data provided by the Department of Transportation, United had more “pet incidences,” which refers to injuries, deaths, and losses, than any other major airline in 2016. There have been 14 injuries and nine deaths. Delta, which ranks second for pet incidences, is responsible for five deaths and five injuries. Skye Gould/Business InsiderAirline incidents involving pets in 2016. United’s current pet policy says that all animals must be kept in a TSA-compliant carrier and be tucked in the seat in front of the passenger at all times. The airline apologised for the most recent incident in a statement to Business Insider.